At some point in time there will be times when you will have a bunch of clothes that you can no longer wear. This may be due to you gaining weight or hopefully because you lost a bunch. Whatever the case may be what the heck are you supposed to do with all of those unwearable clothes you will now have? • Donate them: Of course the easiest thing to do with all of your unwanted clothing is to donate them. Your local Good Will donation center will be more than happy to accept your unwanted clothes. This is great because they then sell them at really cheap prices to anyone in need of clothing. What’s even better is that they will give you a receipt with an approximate value of the clothes you donate that you can then write off on your taxes. Talk about a win, win situation. • Exchange them: There are many websites now that are set up specifically for clothing exchanges. What you do is find someone with clothes that no longer fit them or that they no longer want and see if they are interested in any of your unused clothing. If they are then you can set up an exchange and each of you will end up with a new set of clothes. • Sell them to a vintage shop: If your clothes are old enough you can actually make a little bit of money with them by selling them to a vintage shop. You won’t make a killing, but something is better than nothing. • Have a yard sale: You can also have a yard sale and sell your unused clothing. Once again, you won’t get rich, but a few dollars is better than no dollars. Besides you can also sell some other stuff you have lying around the house. Use the proceeds and treat yourself to some new clothing. • Go eBaying: If your unused clothes are designer, check out eBay before you do anything else. 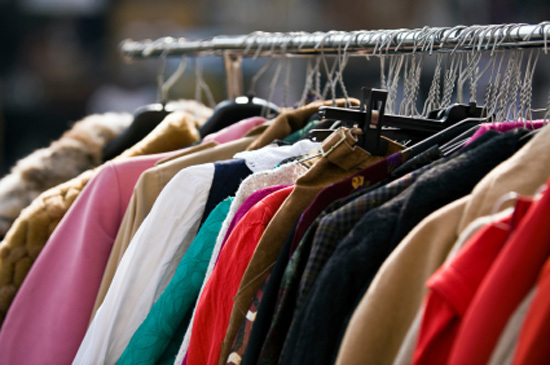 You might be surprised at the amount of money you can make by selling some used clothes that are in good shape. Really when you think about it makes sense. The people buying your clothes are getting brand names at discount prices and if they are buying something like your jeans then they will come pre-broken in. • Upcycle them: If you end up with clothes that are too tattered to donate or sell then upcycle them. Upcycling is where you take something of no use and use it for something else. In other words, you turn it into something useful. For example, you can tear up an old cotton shirt and use it for rags when you detail your car. There are many websites now that are packed with ideas on upcycling so go nuts with it. The last thing you should do with clothing that you no longer wear is throw it away. If you don’t want to deal with selling it, donate it. Remember, just because the clothing no longer suites your needs doesn’t mean that it won’t suite somebody else’s.